So summer has officially started and we are all going crazy about going to the beach. And the best part, you finally decided to bring your “best friend” with you. After all, it is always a better experience when we have them by our side, right? But before you and your dot get too excited about your getaway, for the safety of your pet and the people in the beach, you need to know first how you can prepare your dog for the unfamiliar environment and setting. First things first, not all beaches allow pets. Before you head to your preferred beach, do some research first. Some beaches allow dogs but with restrictions like they have to be on leash all the times or they are only allowed on a specific area. Know what to expect you won’t be disappointed when your expectations are not met. Understandably, your pet will be really ecstatic seeing the vast waters, sands and lots of unfamiliar faces. Generally, it is very advisable to have your pet trained first before bringing them to crowded places. If you think you can control your pet, then it’s fine. But if you think your pet has a tendency to be aggressive around unfamiliar people and environment, better have him or trained first. Places like Sit Means Sit offers obedience training. This will teach your dog how he should behave on different situations. Just for your dog’s safety, leave his or her collar with him or her at all times. You can indicate your contact details too, just in case you pet gets lost. Even well trained dogs can be distracted with all the fun things in the beach so it is better to keep him tagged. A lot of people won’t be able to help themselves and probably sneak to give your cute dog a little pat or play with it. However, there are beachgoers who won’t like or enjoy (for many reasons) your pet’s company. Whatever happens, don’t let your dog disturb other people – keep him or her on leash if you must. Don’t let your dog chase after seagulls or hound sea animals like seals and sea turtles or feed on the live fish. This is of course for your own dog’s safety and the preservation of the other living creatures at the beach. Keep your eyes on your dog. ALWAYS. If you want to give your pet some freedom and you decided leash is just lame for the beach (only if the beach rules permit), make sure you watch your pet like a hawk at all times. Watch out for untoward incidents like fight with other pets, biting a human, knocking off children’s sand castle, running over people sun bathing, and thing like these. Do I need to say more? This is the most important rule you and your pet have to obey. Covering your dog’s poop with sand or just letting the tide bring it to deep waters is very wrong in many levels. Always have a waste bag ready in case you pet decided it’s time to let it go. Garbage bins are all over the beach so there is no reason for you to leave your trash behind. Aside from the harm it does to the nature and environment, it can also be dangerous to other curious pets who love to dig and taste thing around. Just because there are rules to follow does not mean your beach time will be less fun or exciting. It’s fairly simple: abide in all the rules and let your dog have fun. Let him or her swim in ocean, meets new fur friends and socialize with them. And most importantly, use this quick vacation to bond and get to know your dog even more. 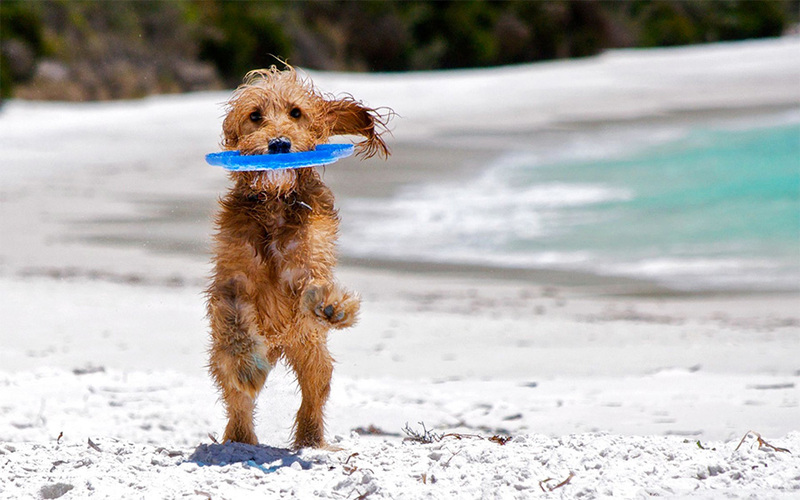 With all these things in mind, you and your pet will sure have a fun and fulfilling day at the beach. Just don’t forget to bring all your pet supplies and emergency kit and you are good to go. Have fun under the sun!